Here's a big airmail cover from the '30s. It originated in Lima, Peru, and passed through Paris on October 31. Note the airmail promotion slogan cancel. The cover arrived in Vienna on November 2. There is another transit mark on the reverse which is dated November 1. I cannot make out what it says. 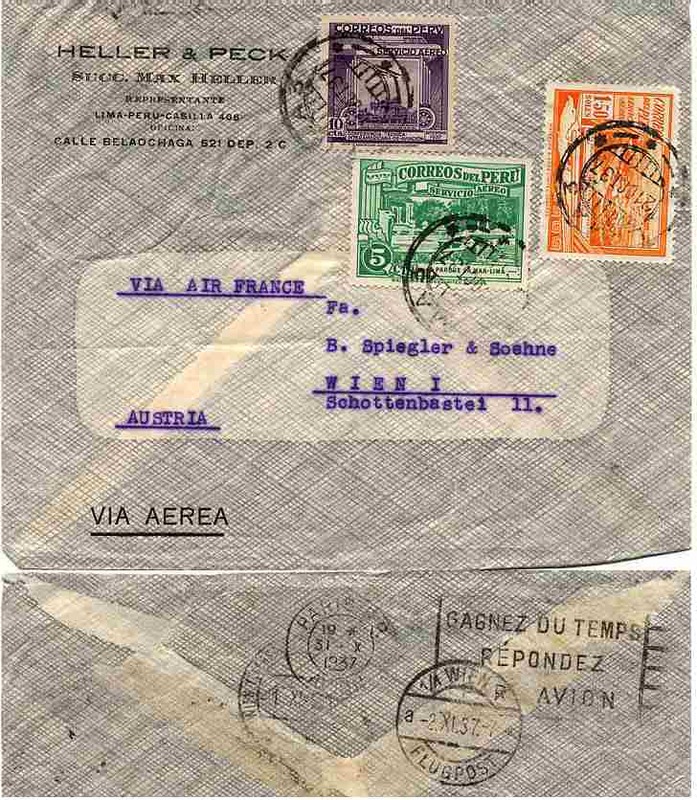 The cover has two nice airmails from the 1936-1937 series. 1.50 sol orange yellow of the Jorge Chavez Aviation School (Scott C35). The 1937 10 centavo violet commemorates Peru's first flight (Scott C43). Juan Bielovucic flew over the Lima race course January 14, 1911. Inter-American Technical Conference of Aviation.